Many years ago when I was much fitter (and much slimmer!) I went down Swildon's Hole in the Mendip Hills. Once down past the 40 foot and 20 foot pots, the cave levels out a bit. I remember that, every so often, one would pass a small heap of wet lime where a previous caver had emptied his (or her) acetylene helmet lamp and refilled the carbide container. I remember that the trick was to cup one's hand over the reflector to allow sufficient acetylene to accumulate before operating the spark igniter. I was brought up in a BC mining town where miner's carbide cap lamps were common. In the '40's there was a conversion to electric lamps which liberated hundreds of carbide lamps that became toys for the more youthful element. In these days carbide lamps were blamed for many fences and garages burning to the ground and even a house or two but the biggest problem was that when the flame was extended it produced a very dark black soot on any object it touched and for a few years almost every window and painted area in town was covered with rude graffiti written in carbide soot. As Pete.W says the starting technique was to turn on the water a bit and cup your hand over the reflector for a few seconds before drawing your hand off over the flint-wheel. My understanding was that if the flame was moderated a single filling would easily last 10 hours although the water might have to be topped up. 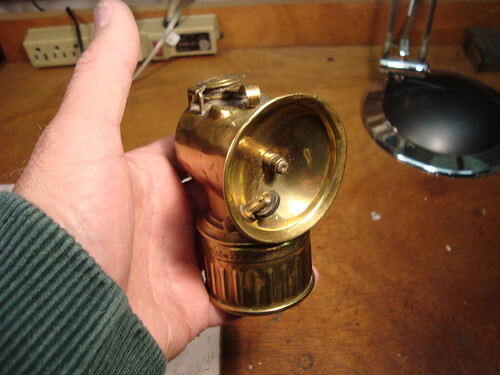 There are still many carbide cap-lamps around although carbide IS hard to get. Here's one that hangs on a nail in my shed...it's a typical "Justrite" miners cap lamp. Of course I never took part in any malicious activity but I did learn that carbide and water makes brand-new blue-jeans turn white and crumble away in minutes. Good job, thanks for the memories KRV3000, yours is very pretty.